⒈ Dual pockets allow you to safely and convenience carry everyday essentials in this crutch pouch. ⒉ Hold the important things in the Velcro crutch pouch, Easily get items when stored in outer bag. ⒊ Simple design and easy to install (on most underarm crutches) by six Velcro straps can fix it in position for the best reach. ⒋ Made of waterproof& lightweight polyester material to keep contents safe and dry. It is a nice crutches accessory for you, purchase it! [ Great for Adult/Youth Crutches ] Dual pockets allow you to safely and convenience carry everyday essentials in this crutch pouch. 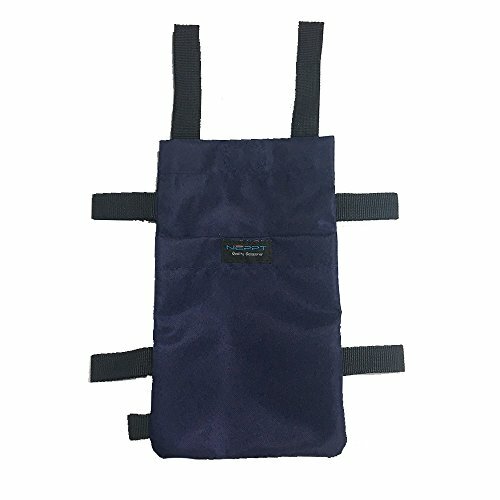 [ Great Crutches Accessories ] Hold the important things in the Velcro crutch pouch, Easily get items when stored in outer bag. [ Secure Non-slip Fastener ] Six Velcro Straps can fix it in position for the best reach. [ Ergonomic and Lightweight ] Made of polyester material to keep contents safe and dry. Can be machine washable (cold water & line dry), durable and convenience.